Stuck in someone else's frames? Click here to break free! Florida Gets New Temporary Tags! Florida has recently changed their Temporary tags. The new sequence for the temporary tags are now ABC1234. The new temporary tags have many small imprints of the state of florida on the background. ATTENTION: Anyone that has information regarding 1981 Broward county or South Florida plates in BAC series or close to it please contact me. Thank you! Live in Florida? Want to see the new plates coming to Florida? Would you want to sign petitions of pending plates? Please click link above to see available petitions you can sign! Donate To Florida Plates & More! 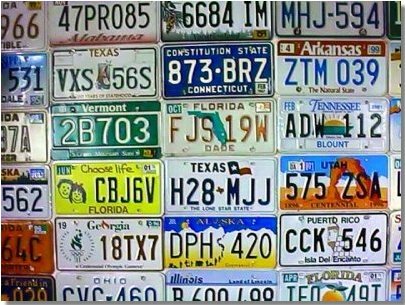 Help Keep Florida Plates Online! Keep searches simple to find better results. Get Search Tips Here! 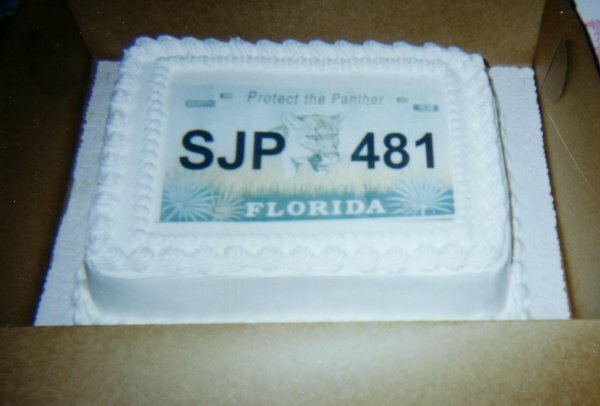 Click photo below to see my 2003 License Plate Birthday Cake! Have comments or suggestions? If so take part in a survey about this site? Site viewed best with IE6!